Cape du Couedic is the south-western point of Kangaroo Island, off the coast of South Australia. Cape du Couedic was named in 1803 by French explorer Nicolas Baudin in honour of his friend and famous French sea captain Charles Louis, Chevalier du Couedic de Kergoualer (1740–1780). The Cape du Couedic Lighthouse is a prominent landmark. Constructed between 1906–1909, it consists of a tower built from 2,000 pieces of local stone, together with three four-roomed cottages to house the head keeper and two assistants with their families. The light characteristic shows two flashes every ten seconds, emitted at a focal plane height of 103 metres. A Fresnel lens made by Chance Brothers is used there. 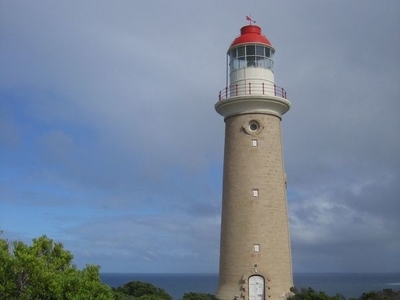 Here's the our members favorite photos of "Lighthouses in South Australia". Upload your photo of Cape du Couedic!